I adore pesto. Plain and simple fact. It is SO easy to make and I love to throw it on or in so many different things. I love my family’s version because it incorporates spinach, adding a great flavor and saving a bit on money. It still uses basil, but not tons of it. Basil is absolutely wonderful but it definitely can get a bit pricey. I love to throw this on spaghetti with some sun-dried tomatoes and crumbled feta or in my sandwiches. You could use this recipe for so many different things, and believe me, I do! This particular time, I put it on my sandwich. This recipe really dresses up your ordinary sandwich and makes it something fancy. I felt like this Turkey Pesto Ciabatta sandwich would be something I ordered from a nice restaurant, when really, it took two seconds to put together and a fraction of the cost. Oh, I love pesto! I just recently tried an aspragus pesto which was really yummy! 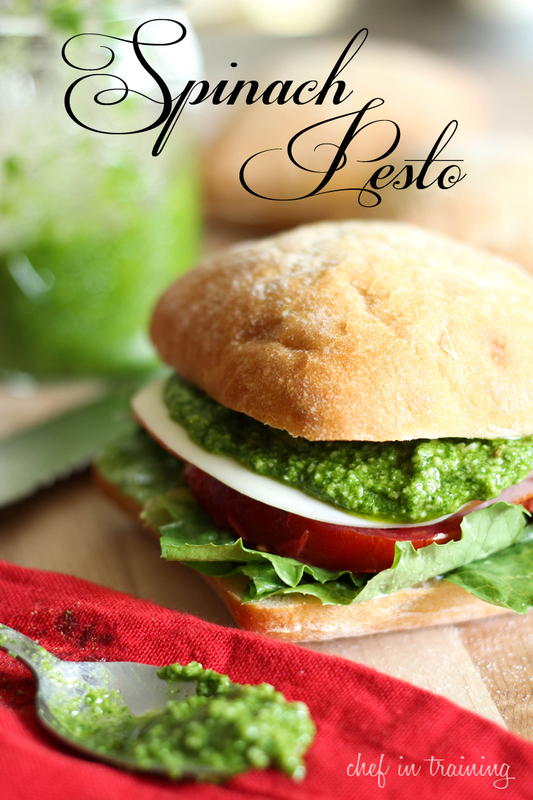 Now, I need to add this spinach pesto to my list of things to try! Wow this sounds and looks so wonderful! Thanks for sharing your tried and true family recipes! I love pesto and am excited to try this! Have a great day! I think I love you, Nikki! Pesto is my fave "condiment?" ever. I love it on my pizzas, I love it with pasta, and I love it on sammies. Your spinach-ified version looks beautiful AND amazing, and is perfect for me since basil isn't one of my most fave herbs. I love excuses for exploiting--er, borrowing--my roommate's blender. Thanks so much for sharing! I've always wondered how to make homemade pesto! Thanks for sharing the recipe, I'll have to give it a try soon! Yummm I love pesto, I've never made it with spinach though. Your photo is stunning! I have never had pesto because for some reason, I always assumed it was something gross in it. I was recently watching The Pioneer Woman on FN and saw it was basically basil, oil, and parmesan, things I love. So that's what I get for assuming, huh? I really like that yours has spinach! My family loves spinach :) Can't wait to try this out! Amazing! You stun me again with your amazing pictures and the way you make my mouth water!